SANTA CLARA, Calif.--(BUSINESS WIRE)-- Arista Networks (NYSE:ANET) today announced a new family of multi-function leaf and spine platforms. Based on the Barefoot Tofino™ series of P4-programmable Ethernet switch chips, the Arista 7170 Series delivers flexible systems for a multitude of applications across cloud networks. The new platform, running Arista EOS® (Extensible Operating System) SDK, delivers up to 64x100G in a 2RU form factor. Enterprise customers benefit from the advanced telemetry and security profiles, while Service Providers can take advantage of large scale security features and NAT (network address translation). The Arista 7170 Series replaces expensive, legacy networking appliances and routers by moving critical functions into the network. “With the Arista 7170 Series and EOS we are able to offer new and interesting features that leverage the flexible pipeline of the 7170 Series. At the same time, we took advantage of the programmability to increase the scale of many existing features for tunnel encapsulation, filtering, traffic analysis and address translation,” said Hugh Holbrook, Vice President, Software Engineering for Arista Networks. The multi-functional platform increases server performance by offloading Hypervisor vSwitch networking functions such as tunnel termination, security policy enforcement and address translation onto the leaf switch, allowing more work to be accomplished by the compute pool, saving equipment costs and lowering power and cooling. Additionally, as it’s EOS-based with a comprehensive set of features, the same device can be used in multiple roles, each with its own profile, ensuring consistent management and provisioning. "With Tofino, Barefoot has proven that programmability can be delivered without compromise on performance and I believe that future switch chips will be fully programmable - there is no reason not to. It allows protocols to be lifted up and out of hardware into software. Arista’s first Tofino based platforms do exactly that, using P4 to deliver customized profiles to their customers. Programmable switches take differentiation in the market to a whole new level. This is going to get interesting,” said Nick McKeown, Chief Scientist and Co-Founder at Barefoot Networks. The 7170 Series with Arista EOS supports a rich set of both data plane and control plane features and capabilities with a programmable SDK for deployment in either a leaf or spine role in two-tier cloud networks with the default cloud profiles. Additional custom profiles can be defined in P4 to add features, alter the operation or change the lookups performed across the data plane for packets passing through the 7170 switch. The 2U 7170-64C supports up to 64 ports of 100G or 12.8Tbps, with up to 5Bpps of packet forwarding and a fully shared packet buffer. 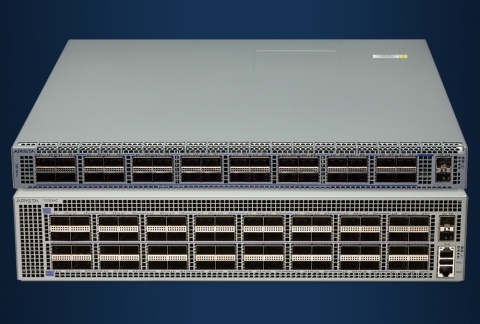 The 7170-32C is a compact 1U with 32 ports of 100G and the same range of profiles. The 7170 Series is available now, with a choice of EOS Profiles. Additional profiles will be released over time, with the security and telemetry profiles planned for August 2018. Pricing starts at $1200/100G port for the 64 x 100G system. Join us on Thursday, June 14, for a webinar on Arista’s new multi-function platforms. Register here. ARISTA, EOS, CloudVision, FlexRoute and AlgoMatch are among the registered and unregistered trademarks of Arista Networks, Inc. in jurisdictions around the world. Other company names or product names may be trademarks of their respective owners. Additional information and resources can be found at www.arista.com. This press release contains forward-looking statements including, but not limited to, statements regarding the benefits of the design and implementation of Arista's EOS and Arista’s family of multi-function leaf and spine platforms, software and the enablement of greater performance, efficiency and cost savings. All statements other than statements of historical fact are statements that could be deemed forward-looking statements. Forward-looking statements are subject to risks and uncertainties that could cause actual performance or results to differ materially from those expressed in the forward-looking statements including: our limited operating history and experience with developing and releasing new products; product, support or service quality problems; rapidly evolving changes in technology, customer requirements and industry standards as well as other risks stated in our filings with the SEC available on Arista's website at www.arista.com and the SEC's website at www.sec.gov. Arista disclaims any obligation to publicly update or revise any forward-looking statement to reflect events that occur or circumstances that exist after the date on which they were made.